A little more progress was made on the weekend. I pulled the sump off and drained all of the old oil out. The bottom of the motor was so dirty and covered in old oil and road grime that both of the drain plugs are seized in place with dirt. The only way I was able to get the old oil out was to use 2 cans of degreaser and a wire brush to clean up as much of the dirt from the 6 sump bolts and drop that instead. Once I got the sump plate off, I used another 3 cans of degreaser trying to get more of the dirt off of the outside of the sump plate (including soaking it for 3 hours in the degreaser and then scrubbing). I can now see that the sump is in fact made of aluminium, but I still have a long way to go to get it very clean. I may need to look into borrowing a friends air compressor and making my own temporary soda blaster to strip the sump plate and the bottom of the motor. I would also then soda blast the fins on the motor to clean them up a little. I know that soda blasting isn't overly abrasive, so it wont remove all of the pitting itself, but if I can get it very clean with the soda blasting I will then finish off the motor by hand with some sanding and metal polish to get it back to it's former glory. Over this coming long weekend I am going to pull off the right side cover of the motor, check out the clutch, give it a good clean under the cover and then I will be ready to start putting the motor back together with new gaskets for the side covers, the new oil filter and sump filter and some new oil. Then I will need to check the timing and I will be able to kick it over and get it started. Before getting it back together though, I need to order two gaskets that I missed ordering last time. I will also order a new clutch pushrod seal, as it is a none seal that will leak as soon as you start a motor, so I will go ahead and replace that before starting. Now that my parts order has come in, I have started work on the bike again to get it going. This weekend I have put the carbs back together with the rebuild kits plus new main pilot jets as one of my old ones was blocked and would not completely clean up. This came to a total of $281 USD plus $46.43 shipping. My Total came to a total of $361.50 AUD for the parts. I know that I will later be ordering a Pamco Ignition ($199 with everything I need) plus at least a few copper gaskets and probably a few bearings, so I am not done yet. My current project costs sit at me being $195 out of pocket. I think I am doing alright so far. Today the adaptor bracket to create the permanent magneto setup arrived. This bracket is cast by hand by a guy from the US who was one of the first to look into using the Yamaha Banshee Rotor on an XS. It is a great little adaptor and it is a shame that it is going to get covered and hidden away, but it will make the bike a better chopper. This also means that I am only waiting on the Honda Stator to arrive and I have all the magneto parts. I also dug through my boxes of car and bike parts and found my Regulator/Rectifier that I purchased a couple of years back when the CBR had charging issues. The stock Reg/Rec turned out to be ok (my multimeter at the time was stuffed) and I actually had to replace the stator due to some fried windings, but this is a suitable reg/rec for the magneto setup, so it has worked out well. 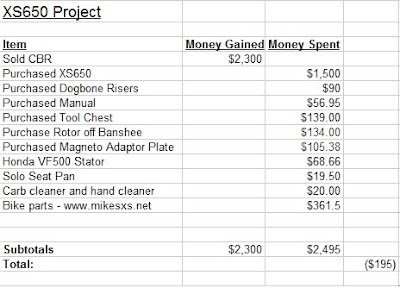 I have also created a list of the parts that I need to order, so far it has all the carb parts that I need, and once I check out a bit more of the bike this weekend I will know the other parts that I will initially need. No doubt I will end up making another order for parts later on, but the parts now will get the bike running correctly. I thought that I would post up a few parts that I have collected ready for this project so far. First up are the Risers that I got at the Toowoomba Swap Meet. I am very happy with these. A little bit of metal polish and a soft cloth and they will clean up very nicely. Secondly is the Solo Seat Pan that I purchased of Dan at Slice N Dice. I went and picked this up off him yesterday and had a chat about bikes and my project. Finally is the Yamaha Banshee Rotor that arrived today. This is the first part of my Permanent Magnet Alternator. I won't be using the stator that is bundled with this as I have the correct Honda VFR500 stator coming along with a generic Reg/Rec which makes up the system that will allow me to go batteryless. I also managed to get the stuck jet out today, so they are all soaking and getting a good clean so I can see if they will be ok or if they need to be replaced.